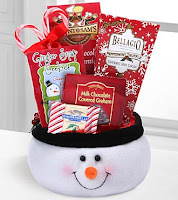 Check out this adorable little Snowman Snack Basket filled with goodies! Makes my mouth water…YUMMY!!! You can get this sent to someone you care about for only the cost of shipping! In fact, when you look at the link, you will see the cost is -$0.01!! You can search around for other items that are marked down as well. As the title says, you will have to pay for shipping. Those costs will vary. The closer you get to Christmas, the higher the cost — so grab this and mail it right away so you can really save. Oh — and be sure to go through on of the links above (don’t try Ebates or Shop at Home), or you will not be able to get these deep discounts. Update — MANY items are already sold out — but look around because some things are only $4.99 and shipping is $9.99 – making your gift only $15.00!